Markets “go up and down,” the White House press secretary Jay Carney noted this month. So do presidential approval ratings. 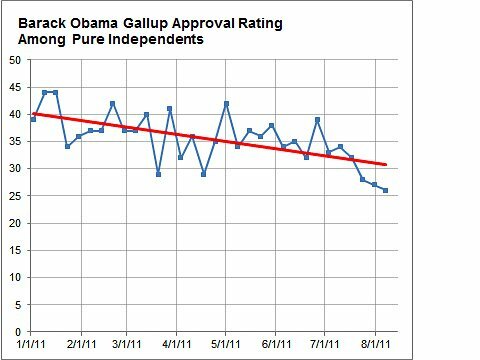 But the trendline for President Obama has been poor. His Gallup approval rating has twice fallen below 40 percent within the past week, a threshold he had previously avoided crossing. The trend has also been evident in other polls. The drop in Mr. Obama’s approval ratings has not been especially deep by historical standards. So far for the third quarter (which began July 1), his Gallup approval rating has averaged 43.3 percent as compared with 46.8 percent in the second quarter, a decline of 3.5 points. There have been 76 occasions in the past when a president’s approval ratings have dropped by more than that from quarter to quarter. If Mr. Obama’s approval ratings remain near the 40 percent mark or below for the rest of August and September, he has a chance to move up the list of historically significant declines. But so far this is within normal bounds. If the decline in Mr. Obama’s approval ratings is not especially deep, however, it is broad — affecting essentially all demographic groups, including many that will be critical to his re-election efforts. 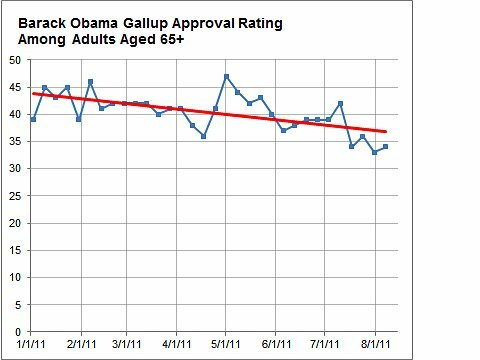 The trendline for Mr. Obama’s approval rating among voters aged 65 and older, for example, shows roughly a 7-point decline over this period: to 37 percent today, from 44 percent at the start of 2011. Unfortunately for Mr. Obama, figures like these are quite common among many demographic groups. In the chart below, I’ve used this same method to track the magnitude of Mr. Obama’s approval ratings decline among 27 groups that Gallup studies. The trend for all 27 groups has been negative. And although the margins of error on this calculation (represented by the red bars in the chart) are fairly high, the decline has been statistically significant in 24 of 27 cases. Three groups in particular stand out for having especially large declines. First is what Gallup terms “pure independent” voters, among whom Mr. Obama’s approval rating has dropped by 10 points since the start of the year. These pure independents are true swing voters; Gallup defines the category to exclude the many voters who call themselves independent but in fact lean toward one or another party and behave like partisans. It should not be surprising that when Mr. Obama’s approval rating declines, the decline will be especially steep with this group — they are called swing voters for a reason, and their political views are often volatile. Still, this is an inauspicious group to be losing favor with if Mr. Obama wants to win another term. 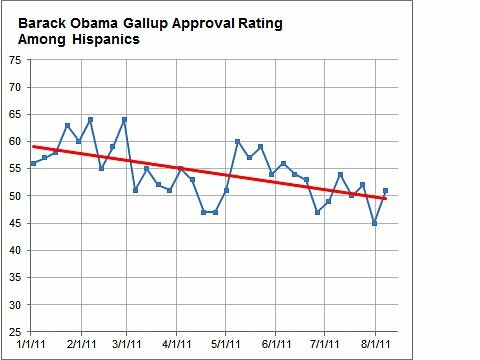 Another group with whom Mr. Obama has experienced an alarmingly large decline are Hispanic voters — also about 10 points since the start of the year. Although the margins of error on subsamples of Hispanic voters can be especially high because of language barriers and other issues, that could complicate Mr. Obama’s efforts to win states like Colorado and Nevada. 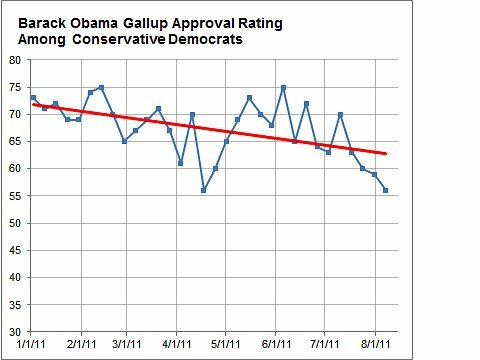 Finally, Mr. Obama’s approval ratings are down about 9 points with conservative Democrats. They are also a swing group to an extent: about 20 percent of conservative Democrats, and 37 percent of white conservative Democrats, voted for John McCain in 2008. And they are plentiful in states like Ohio. Many black Democrats also identify as conservative. Mr. Obama has experienced an approval ratings decline of about 6 points since the start of the year with African-Americans — larger than with white voters. 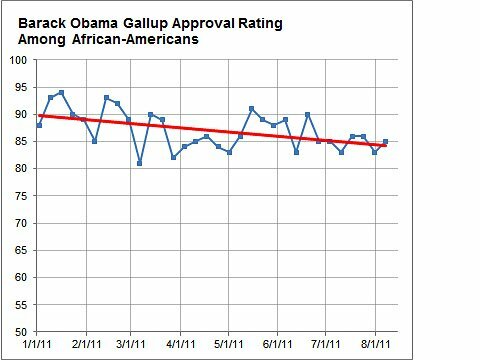 Although it is not clear how many black voters would actually vote against Mr. Obama in November 2012, his approval ratings among black voters had been exceptionally resilient before now. 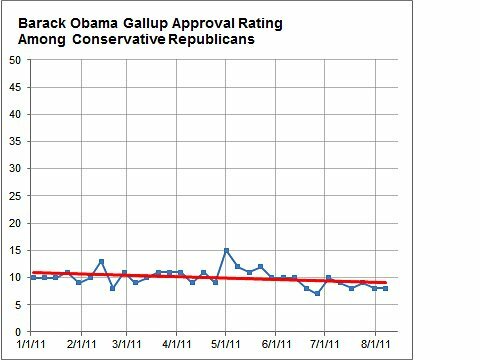 On the other end of the spectrum, Mr. Obama’s approval ratings have barely declined with conservative Republicans. This is easy enough to explain: so few of them approved of his performance in the first place, there wasn’t much more room for the numbers to fall. 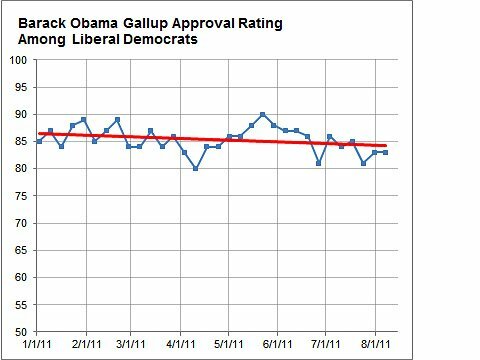 Mr. Obama’s approval rating decline has also been smaller than average — about 3 points since the start of the year — with liberal Democrats. Although many leading liberal voices were unhappy with the debt ceiling deal that Mr. Obama struck with Republicans this month (justifiably, in my view), this just isn’t showing up in a big way among the liberal rank-and-file. One thing to keep in mind is that if most liberal Democrats had strongly approved of Mr. Obama’s performance before, then a “downgrade” in their views of him might be toward less enthusiastic approval, rather than to outright disapproval. Although these liberal Democrats might not vote against Mr. Obama, less enthusiastic support could translate into reduced turnout, volunteerism and fund-raising for the president’s re-election campaign. Nevertheless, analysts should be careful to distinguish the liberal blogosphere from liberal Democrats over all and furthermore from the Democratic base, which includes many voters who do not identify themselves as liberal. Ultimately there is plenty of blame going around, with Democratic base groups and swing voters having come to view Mr. Obama more negatively. 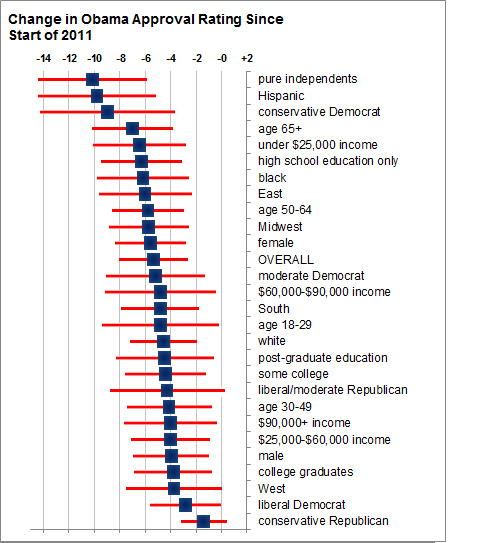 This should not be surprising: the unhappiness with Mr. Obama is not a matter of small-bore, constituency-based politics. Instead, it revolves around more fundamental areas like the economy, questions about the efficacy of his leadership, and an overall gloominess about the direction of the country, issues which transcend demographic and partisan boundaries. Breaking down an approval ratings decline in this fashion can sometimes create the false impression that a president is dying by a thousand cuts, when his problems instead usually revolve around no more than two or three major issues. The good news for Mr. Obama is that if the decline has been broad-based, an improvement in his numbers would probably have broad effects, too, particularly if it is driven by improved economic fundamentals. In the past, presidential approval ratings have had a reasonably strong tendency to revert toward the mean, particularly in a president’s first term. For whatever reason, the autumn of a president’s third year has often been kinder than the summer: Ronald Reagan’s approval ratings began to turn positive in November 1983, while Bill Clinton’s did in late September 1995. Mr. Reagan, however, was buoyed by an 8 percent annualized rate of economic growth in late 1983. Growth for Mr. Clinton was only ordinary — about 3 percent in the latter half of 1995. But even that level is unlikely to be achieved in the next three to six months, according to most economists’ forecasts. At the same time, the relationship between the actual performance of the economy, Americans’ perceptions about the economy and their views of the president are more nebulous than most analysts would acknowledge. 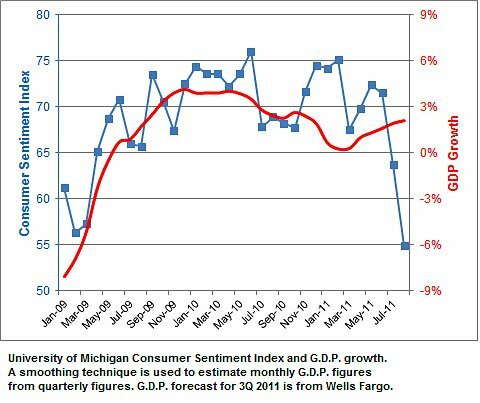 There has been an extremely sharp decline in consumer confidence within the past four to five weeks, for example, while investor sentiment — as evidenced by the volatile and mostly negative movement in the stock market — has also turned dim. It seems likely that political events like the debt ceiling debate, and the S.&P. debt downgrade that followed, are responsible for this at least in part. Fundamental data, however, has been more mixed and probably does not point on balance toward a recession. So Mr. Obama could see some improvement in his approval ratings — say, back into the mid-40s — if these sentiment-based measures snap more into line with the fundamentals. That would not put Mr. Obama in a great position, but he essentially would be where he was before, with a fighting chance of winning re-election against a good Republican nominee and reasonably strong chances against a poor one. Or it may be that a lack of confidence in Mr. Obama — as well as the Republicans in Congress — will itself prove to be an impediment to recovery, and that these numbers could continue to erode. One does get the sense that we’re nearing an inflection point.